Homemade flowers!! You can make your flowers with punches, cutting out stamped images, with die cuts from dies or a cutting machine. Use your imagination! I can't wait to see all the beautiful flowers you all create! 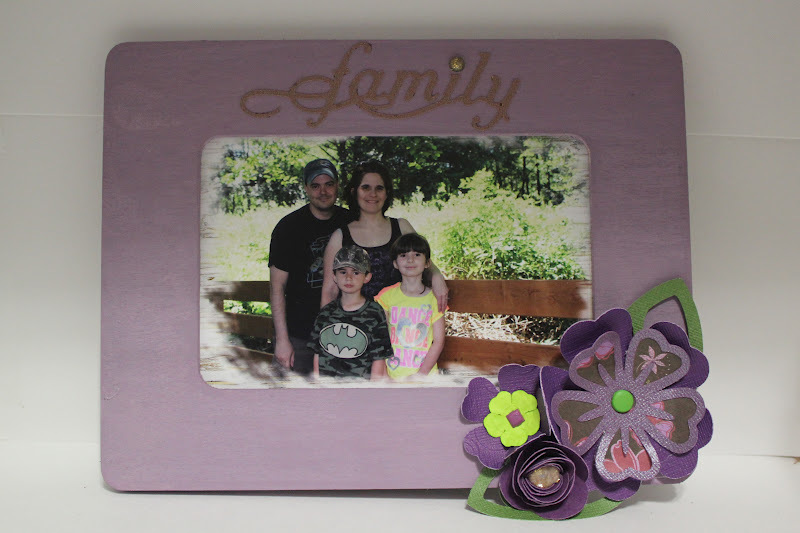 You have until Friday, April 27th to link up your creation to get entered into the monthly drawing this week. When uploading to online galleries please use code HIMCR43. Flower layers were cut at 3". Card front: SU Baja Breeze 4 1/8" X 5 3/8", DCWV 'the spring stack' 4" X 5 1/4"
I am so proud of the Hiding in My Craft Room Design Team!! Please be sure and visit their blogs and show them some love! Here is the monthly giveaway for the April weekly challenges! AHHHHH!! I was suppose to post this on the 8th!! I think I should just let you all know that I'm probably going to be to off for the next few months until we get moved and settled! I will continue to post challenges and fun stuff so please keep checking back. Glenda Atkins from Gilby's Corner!! Congratulation Glenda! Please use the Contact Me button to safely send me your shipping information. If you don't want to miss out on getting your chance at the April Montly giveaway be sure and check out the weekly challenges, posted each Saturday! I hope everyone had a fun and Happy Easter! I have some fun photos to share with you later tonight. 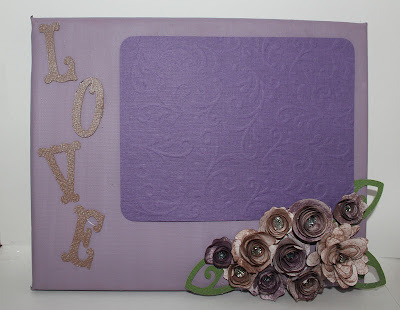 These are Stampin Up colors but remember you can use any colors that are close, any brand! You have until Friday, April 13th (Oooooo! Friday the 13th!) to link up your creation to get entered into the monthly drawing this week. When uploading to online galleries please use code/keyword HIMCR41. "Let your dreams take Flight"
Basic Gray frame was cut from Elegant Edges at 4 1/4". but I just put in on the edge of the card! Clever, I am! or Lazy!! 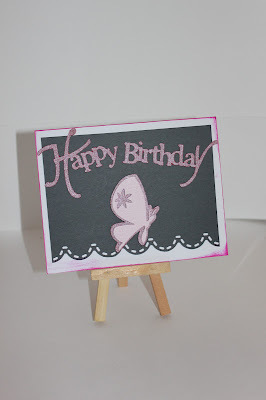 Butterfly was cut from Everyday Pop-Up Cards at 2 3/4". I cut an extra base layer in pink to give it more dimension. I wish the picture showed how she sparkles! Card front: SU Pink Pirouette 4 1/8" X 5 3/8", Rose Red 4" X 5 1/4"
4. You don't have to participate each week to play! The more weeks you play, the more entries you get into the monthly giveaway! I've been so busy lately and haven't had enough time to be 'Hiding in My Craft Room'! But I did sneak off and find a few minutes to make a Super Quick! Yes, I did it in 10 Minutes! I had the stack out and thought I need to just whip something together. The floral strip of paper was a scrap that I just had to shorten to fit. It just feels good to make something! Frame was cut at 3" from the Art Philosophy cartridge. 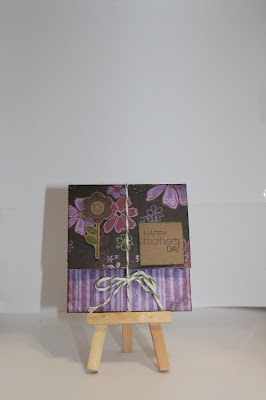 Card front: the Paper Studioe 'Oops A Daisy' 4 1/8" X 5 3/8"
Remember this week's challenge is 'Freestyle' so if all you can find, like me, is 10 minutes you can still be entered into the monthly giveaway! Congratulations Debbie! Please use the 'Contact Me' button to safely send me your shipping information. It's Freestyle this week! So Anything Goes!